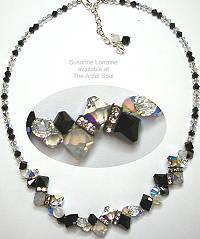 Susanne's jewelry features the most sparkling Swarovski crystal beads. Color and shape inspires her, and the clever combination of these is what sets her jewelry apart. The pieces are like a puzzle, fit together to make an overall attractive design for her finished jewelry piece. The crystal components may come from Austria, but the final jewelry is designed and handcrafted in Michigan, inspired by Susanne's original home of San Diego, California. 1-5/8 inches long including sterling earwire, 3/8 inch across but staggered. Five bicone shapes and cube are cleverly joined with square clear studded spacer to do staggering magic! The sparkling Swarovski crystal colors include black, lavender, golden yellow, tourmaline green and clear. Pendant with Swarovski crystals suspended on sterling wire with bail loop is 1-3/8 inches long. Bicone crystal colors are pale yellow, lavender, light blue, topaz, tanzanite, olive and jet black. Squared rhinestone spacers between central elements. Pendant sold without chain, optional chain addition. 1-1/8 inches long including sterling earwire, about 1/2 inch across the cluster of crystals. 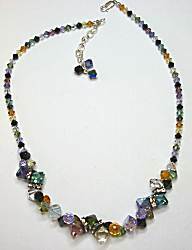 The Swarovski crystals are bicones of the same size, dangling off a little sterling chain, in colors of black, lavender, aqua, tourmaline green, and golden topaz. Adjusts 16-17 inches long with lobster clasp. At the center 2 inches are graduated sizes of diamond-shaped Swarovski crystals in a magical clear AB finish that glints gold and blue, largest drops 1 inch long. They are suspended on a clear beaded chain with clusters of clear AB bicone crystals along the way, very simple and dressy. Adjusts 16-17 inches long with lobster clasp. Swarovski crystals are strung on sturdy flexible beading wire, with clusters of larger pieces spanning the front 5 inches, smaller crystals extending to the back clasp. The shapes include bicones and cubes, there are square clear studded spacers within each cluster. Sparkling colors are jet black, dark aqua, tourmaline green and tanzanite purple. 1-7/8 inches long including sterling earwire, 3/8 inch across but staggered. Six bicone shapes and cube are cleverly joined with a pair of square clear studded spacers to do staggering magic! 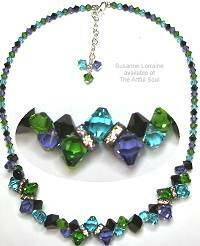 The sparkling Swarovski crystal colors include jet black, tourmaline green, tanzanite purple and deep aqua. 1-1/8 inches long including sterling earwire, about 1/2 inch across the cluster of crystals. The Swarovski crystals are bicones of the same size, dangling off a little sterling chain, in colors of jet black, aqua, tourmaline green and tanzanite purple. Adjusts 16-17 inches long with lobster clasp. Swarovski crystals are strung on sturdy flexible beading wire, with clusters of larger pieces spanning the front 5 inches. The shapes include bicones and cubes, there are square clear studded spacers within each cluster. Sparkling colors are pastel pink, yellow, lavender, smoke and clear. 1-5/8 inches long including sterling earwire, 3/8 inch across but staggered. Five bicone shapes and cube are cleverly joined with square clear studded spacer to do staggering magic! 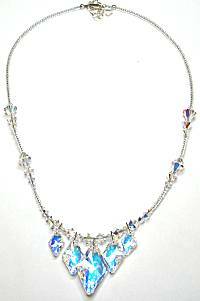 The sparkling Swarovski crystal colors include pastel pink, yellow, lavender, smoke and clear. 1-1/4 inches long including sterling earwire, 1/4 inch across but staggered. Four bicone shapes are cleverly joined with square clear studded spacer to do staggering magic! The sparkling Swarovski crystal colors include pastel yellow, pink and lavender. 1-1/8 inches long including sterling earwire, about 1/2 inch across the cluster of crystals. 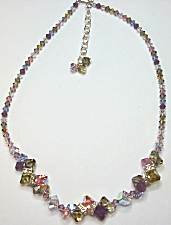 The Swarovski crystals are bicones of the same size, dangling off a little sterling chain, in colors of pastel pink, lavender, yellow, smoke and clear. Pendant with Swarovski crystals suspended on sterling wire with bail loop is 1-3/8 inches long. Bicone crystal colors are lavender, tanzanite, fuchsia, light brown, topaz, light rose and clear. Squared rhinestone spacers between central elements. Pendant sold without chain, optional chain addition. 1-7/8 inches long including sterling earwire, 3/8 inch across but staggered. Six bicone shapes and cube are cleverly joined with a pair of square clear studded spacers to do staggering magic! The sparkling Swarovski crystal colors include pastel pink, yellow, lavender, smoke and clear. 1-5/8 inches long including sterling earwire, 3/8 inch across but staggered. Five bicone shapes and cube are cleverly joined with square clear studded spacer to do staggering magic! The sparkling Swarovski crystal colors include jet black, clear AB and opalescent white/clear. Pendant with Swarovski crystals suspended on sterling wire with bail loop is 1-3/8 inches long. Bicone crystal colors are jet black, clear AB and white opal. Squared clear rhinestone spacers between center stone. Pendant sold without chain, optional chain addition. 1-1/8 inches long including sterling earwire, about 1/2 inch across the cluster of crystals. The Swarovski crystals are bicones of the same size, dangling off a little sterling chain, in colors of jet black, clear AB and opalescent white/clear. 1-7/8 inches long including sterling earwire, 3/8 inch across but staggered. Six bicone shapes and cube are cleverly joined with a pair of square clear studded spacers to do staggering magic! The sparkling Swarovski crystal colors include jet black, clear AB and opalescent white/clear. Adjusts 16-17 inches long with lobster clasp. Swarovski crystals are strung on sturdy flexible beading wire, with clusters of larger pieces spanning the front 5 inches, smaller crystals extending to the back clasp. The shapes include bicones and cubes, there are square clear studded spacers within each cluster. Sparkling colors are jet black, clear and clear AB, opalescent clear. 1-1/4 inches long including sterling earwire, 1/4 inch across but staggered. Four bicone shapes are cleverly joined with square clear studded spacer to do staggering magic! The sparkling Swarovski crystal colors include jet black, clear AB and opalescent clear white. Read about what others think of Susanne Lorraine jewelry! Instead of reviews for a specific product, this is a place to share about the designer line in general.